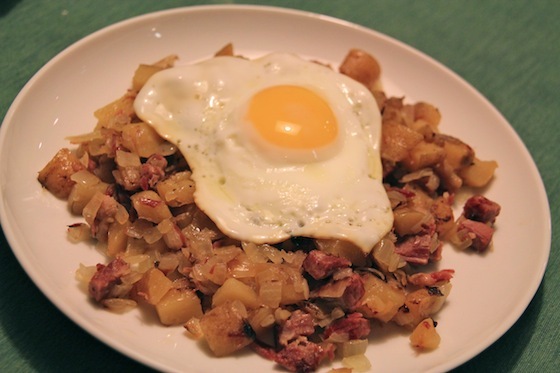 Nick loves corned beef hash. It’s one of his favorite, go-to breakfast orders. I never touch the stuff. Well, that’s not true – just not the stuff that comes out of a can. 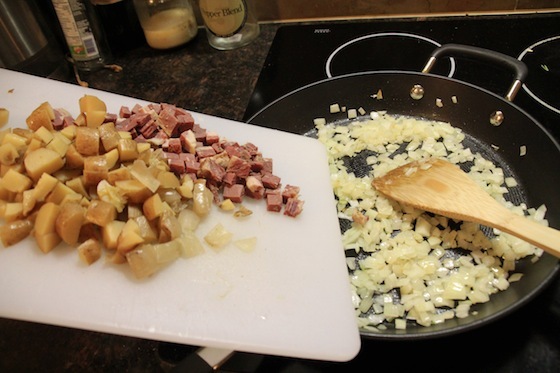 I have had restaurant corned beef hash before, but it was the kind that was freshly made in-house. YUM. 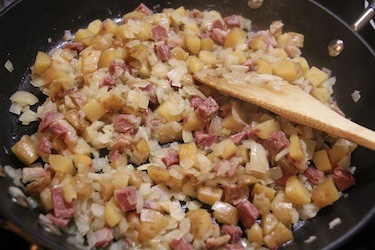 What could be better than meat, potatoes an onions, all chopped up and mixed together for you? No cutting involved at all! 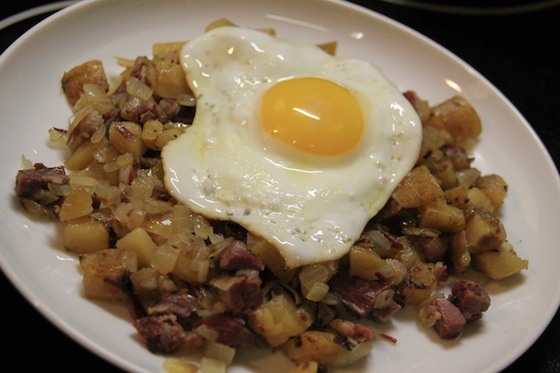 Unfortunately, the restaurants that serve this kind of delight are extremely few, and far between – so I hardly ever eat corned beef hash. 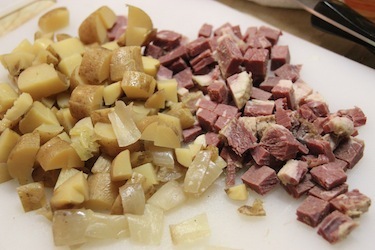 Since we’ve cooked several corned beef briskets in honor of St. Patrick’s Day (two ready-brined briskets for our Tuesday night dinner, and two briskets I brined on my own), I thought I might be able to save a few slices and make some corned beef hash tonight. 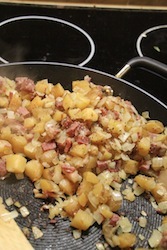 I found this recipe online (I had to alter it a bit since I already had cooked potatoes and most recipes call for raw ones) and it looked good – not too fussy or complicated, it focused mainly on beefy, potatoey goodness (there was one I saw that called for adding cream – I wasn’t too sure about that one). 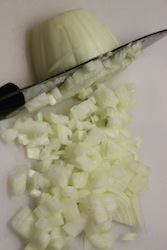 I started by chopping an onion, and cutting the potatoes and corned beef into cubes. 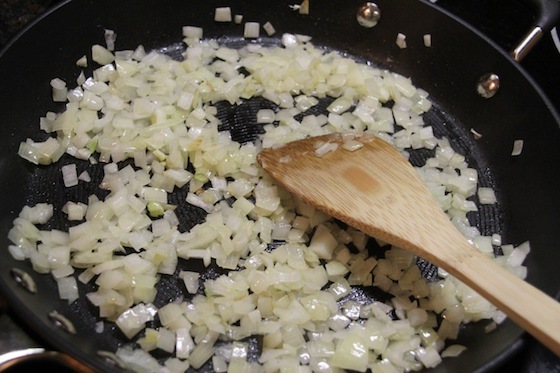 I sautéed the onion in some ghee (clarified butter). YUM. Time to add more deliciousness! I sautéed it all together for a bit, then added the last of the cooking broth I had, plus a bit more beef broth, covered it and let it simmer. 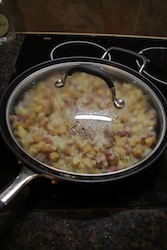 After a few minutes, the mixture was bound together a bit more, but we didn’t want to break up the meat and potato chunks too much, so I didn’t cook it all to a mushy mess. I seasoned it a bit more and ground some pepper over it. I could not wait to taste it. This was delicious. Like I said, I’ve never had corned beef out of a can before (gross! ), and although most of the people I know love it, I’d much rather have this version (although I’m sure they’d all agree too). 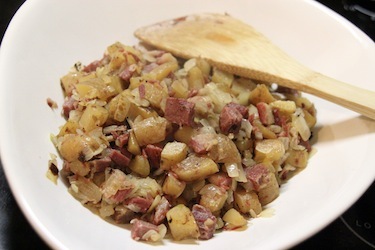 My only regret is that we didn’t have as much corned beef leftovers as I’d have liked from St. Patrick’s Day to make this scrummy hash with. Next time, I’ll have to brine even more briskets!